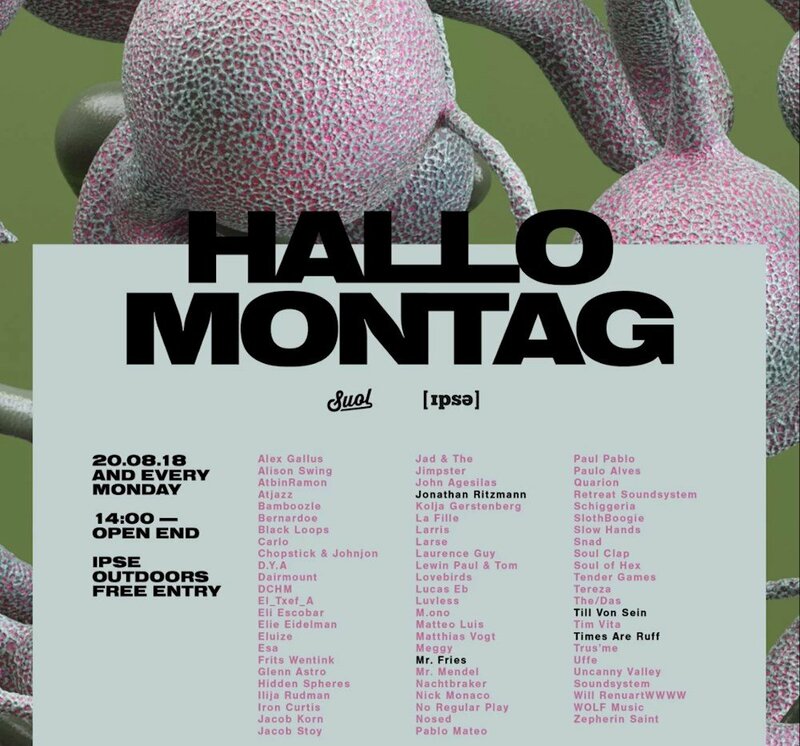 This event "Hallo Montag - Open Air #17 with Till Von Sein, Times Are Ruff and More" @ Ipse has already ended on 08/20/2018. Here you can find upcoming events for this location! Mondays are bad? Make it your favourite day and enjoy the sunny vibes and tunes played by Till Von Sein, Times Are Ruff and many more. Another summer season is here, and at Suol we are once again going to extend your weekend longer and full of music with our weekly “Hallo Montag” Monday open airs. The weekly “Hallo Montag” series is held in the beautiful outdoor venue IPSE in Berlin and we open doors every Monday at 2pm, and ending, well… whenever the last person leaves, which usually goes well over on to Tuesday mornings :) The goal is to take the horror off Mondays and replace it with a joyful feeling instead; dancing to quality music at a beautiful venue, with a delicious drink in your hand and fantastic people around. To put the cherry on top of this caramel sundae, the events are FREE. All you need is a good vibe and your dancing shoes.